I don't think that many users would like to share the exact weather they see to others, and if they wanted, they would share a screenshot, like we already do here. I wasn't talking about sharing weather, I was talking about knowing when the weather occurred if one wanted, say, a slightly rainy day on the beach of a habitable moon orbiting a gas giant. They would never have to wait for it again if they knew when it happened, which would make SE more like the real universe, as the weather that just happened won't be found in the records as something different the next day (even though we can't actually time travel). Also, as for random weather generators being the only ones, are they not psuedo-random, using a seed to determine the result? The second is more of a psychological study of the effects of digital universes, but in the weather section they talked about using algorithms based on how the sun was positioned and the current air pressure. SpaceEngineer, has deferred shading been implemented yet? This means that you don't need a lighting pass that draws light influence goemetries and additively blends each of their lighting effects. Consequently it also means you also don't need to go with a tiled-deferred solution with a challenging light culling pass. All you need to do is a full-screen pass and loop through all the currently active lights and just add their lighting effects right in the shader. This should be a very fast post-processing pass that will be fully coherent (SIMD efficient) without any inefficient texture memory access patterns or heavy ROP usage. A compute shader would be suitable for this too but you're using OpenGL 3.0 so I'm assuming that's out of the question. Lava always emit thermal radiation - from red to yellow. What you are see on this photos is the sulphur burns in the oxygen. Such circumstances may occur only on planets with oxygen atmosphere, and at small scales (it is impossible to have a sulfur lava planet with oxygen atmosphere - all oxygen will quickly end up). But maybe it could be implemented on a certain region of the planet to emphasize the differential structure of the surface, and create the illusion of a diverse geological history in different locations. I have a suggestion for the TODO list about brown dwarfs, linked to the conversation been developed in the thread of Some Astronomy Questions (for Noobs). SE needs to account for the variations on spectral class of this objects (L - T - Y in decreasing hotness). We could say that the L is the only one depicted. The few papers and coments on the internet about the color of T brown dwarfs set them in the purple-violet region. The emitted light gets "intoxicated" by the chemical compounds of the atmosphere so inseted of been a deep red (like a normal black body would do) it glows in purple because of absortion and emission of this stellar atmospheres. The last one, the Y class is nearly indistinguishible from a rogue planet (if they are alone) but the dim light emanated from this sub-brown dwarf can make the upper clouds of the semi planet glow, so they can have colors like blue, red, ect... barely illuminated from the interior black body radiation. 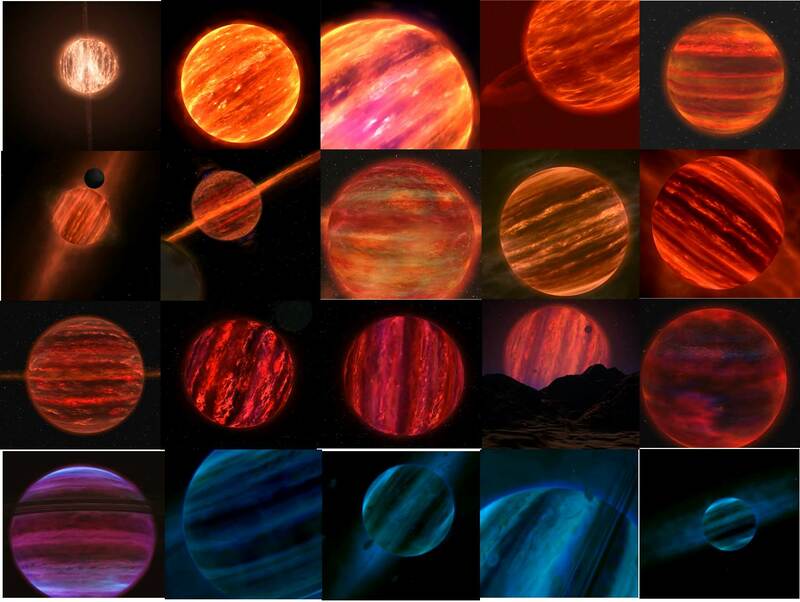 Aside from the variations of colour on SE brown dwarf classification I have a suggestion about the rendering and distribution of the glow. It would be much more realistic if the flare was emmited from different parts of the disk through the clouds like a glowing sphere, even with some spikes where there are less clouds, shinning from close distances inhomogeneusly. The Y Brown dwarfs are very very dim but we could see them also because of the electric activity associated with this kind of stars that would create large scale aurora like dischrges around the object. I've found three youtube channels (I think is the same guy) with quite awesome renders of this brown dwarfs. I don't know how accurate this visualizations are but they look better (in some cases) than those brown dwarfs we have in version 0.9.7.1 of SE (that are still very good). The videos are made for pseudoscientific purpouse (Nibiru-illuminati-annunaki-plkanet x-nasa conspiracy nonsense) but beside the content, the renders that they (or she/he) have made are quite impressive and accurate in my opinion. ]Watch this pics taken from the videos! 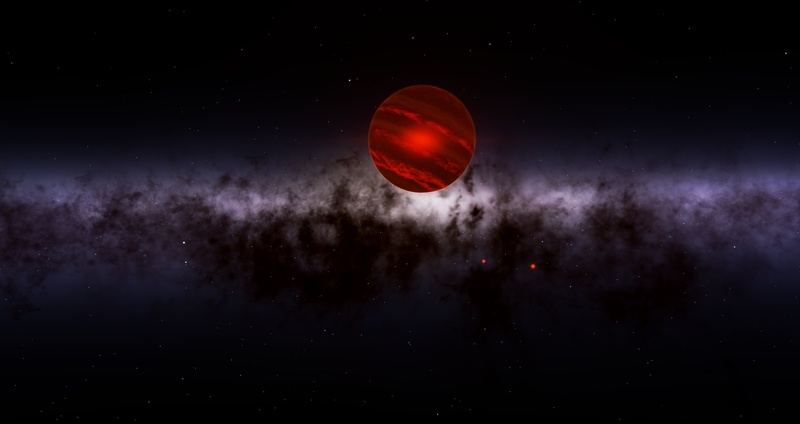 I would love to see SE with that rendering (at high definition, not like the videos) for brown dwarfs it would be also more exciting for search and exploration of stars. Maybe we can contact with the artist so he can tell us the algorithm and Vladimir can see if it can be implemented (if you think is a good idea). That's all. What do you think? (and sorry for been always talking about how to improve SE, the graphics are far beyond every Planetarium Software I have seen but this can get asintotically close to perfection step by step). 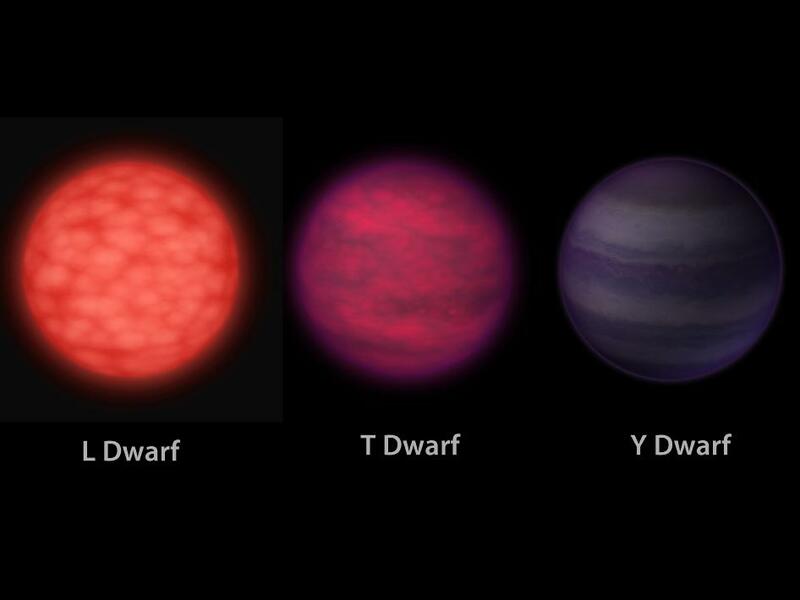 I think this is perfect, those L, T and Y Brown dwarfs would be absolutely perfect! The planets should orbit much closer to them since brown dwarfs have weaker gravity. How about white dwarfs with planets around them? I never see those in the game, they would be awesome (especially really close to them) Maybe to simulate the remains of a solar system that was long destroyed by a yellow dwarf that died (like our sun will) and became a red giant. It would be much more realistic if the flare was emmited from different parts of the disk through the clouds like a glowing sphere, even with some spikes where there are less clouds, shinning from close distances inhomogeneusly. This is impossible. SE flare is a post-effect billboard, they do not know where is brightest part of the disk. It assumed that star is a point source, not a sphere or other shape. Some approach for realistic rendering taking into account the shape is a "super" mode in the settings, but it work only with "SE 095" flare and if the star size on the screen is big enough. How about white dwarfs with planets around them? I never see those in the game, they would be awesome (especially really close to them) Maybe to simulate the remains of a solar system that was long destroyed by a yellow dwarf that died (like our sun will) and became a red giant. I think this depends heavily on the size of the star and how far it swells out during it's red giant phase. 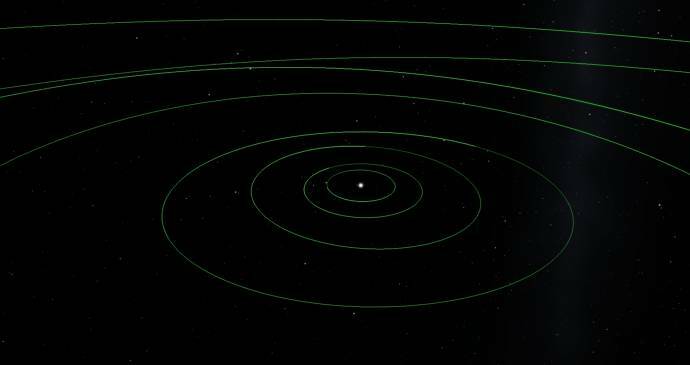 If we take our solar system as an example we would still find planets from the orbit of Mars and out. Some of the closest planets could migrate inwards and many of the further out bodies would be lost, but you wouldn't find many white dwarf systems with 0 planets. I have never found a White Dwarf in SE with any planets, usually they're accompanied by a brown dwarf that has planets, but the white dwarf has nothing. This seems pretty unrealistic to me. This is impossible. SE flare is a post-effect billboard, they do not know where is brightest part of the disk. It assumed that star is a point source, not a sphere or other shape. Couldn't it be implemented with an algorithm like that one you are using for lava planets but with stronger glow and with different absortion for the clouds around all the atmosphere? The flare could still there to see the star shining from far distances but for the close ones this would make the effect. Edit: I think there's a confusion regarding the term flare that I have used. I don't want a new lens flare, I'm calling flare the glowing efects created by the brown dwarf's chromosphere when they get more or less absorbed by the clouds and cooler parts and not only a brown dwarf that shines uniformly with the only beautifull light been the lens flare. The algorithm that has been used to make the renders that I've shown are imposible to integrate on SE? Well there's always John Chapman's Pseudo Lens Flare shader, but that would remove the modding abilities of the current billboard implementation. I totally agree. Plus, the existence of pulsar planets offer yet another possibility: the secondary formation of new planets around stellar remnants after the original ones get destroyed. Or even a third one, although this is probably very rare and should result in highly elliptical orbits: capture of previously free worlds. This will probably be more relevant and common in the densest parts of the galaxies. In other words, all kinds of stellar objects may be able to have planetary systems around them. Likelyhoods will probably be different, and it's possible that the overall structure of those planetary systems will also be different in each case (how? I dunno. But that's a good question. ), but I don't think any type of object should be excluded from having planetary companions. 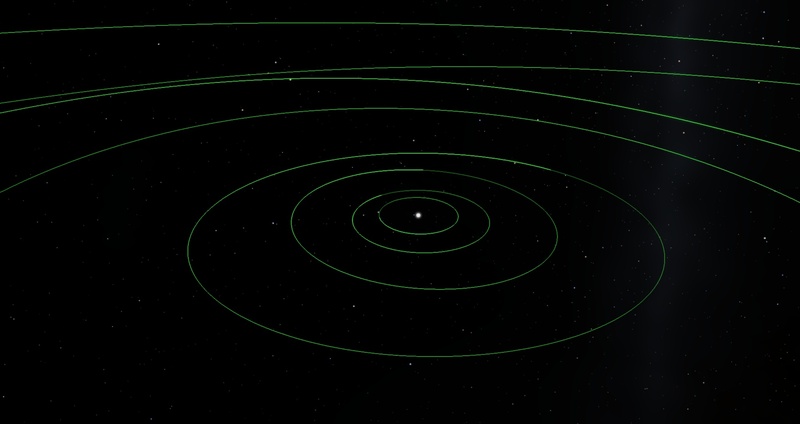 This is exactly how SE limits the size of orbits of planets in white dwarf system. I have never found a White Dwarf in SE with any planets, usually they're accompanied by a brown dwarf that has planets, but the white dwarf has nothing. Hmm, this seems like a bug! I will check it out. Do you mean the bloom effect? If so, bloom is still here, it cannot be disabled for specific object because it is a post-process effect. Brown dwarfs are simply too dark to have noticeable bloom. At least with current exposure system. If you increase exposure to 10 or so, you will see the bloom effect on brown dwarfs. Anyway, I didn't complete the brown dwarfs yes, just wait! It will not remove the modding abilities, because it still needed a set of coordinates where ghost must be placed. And it is more physically accurate, and takes into account the shape of the light source. So I will implement it one day. No, light detection is made by taking the frame and putting a luminance threshold on it; what can be modified however, is the amount of ghosts and chromatic aberration the shader produces. I haven't found any yet. Been searching through Andromeda and the Milky Way. Was that screenshot taken in the 0.9.7.2 build? I'm on the same page as DoctorOfSpace. I have literally never, ever, found a planet around a white dwarf. I found them around neutron stars and even black holes, but never around white dwarfs. I just checked, and I found no procedural white dwarfs with planets in 0.971, so we can call this bug both confirmed, and (it seems) fixed for the next version.